I know that I have SERIOUSLY slacked on my posts and I promise I'm getting back on the wagon. I have some juicy updates about the ladies but have to be careful on how I divulge them. I found out they have Facebook. The last thing I need is H-money and K-dawg to be mad at me. They give me the free toilet paper people. 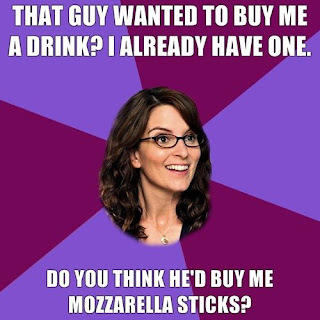 In 2011 I prefer Mozzerella Sticks. I'll buy my own beer. I would totally buy you some mozzarella sticks.